Like many brits I love watching Wimbledon in the Summer, and when Iâ€™m channel flicking I might stop and watch the odd tennis match every now and then, but Iâ€™m not what youâ€™d call a massive tennis fan. However, I have been in love with the Virtua Tennis games ever since Virtua Tennis 2 for the Dreamcast. A large part of my free time at University was spent on the game, and I became quite good (read: unbeatable!) at it. Iâ€™ve owned every Virtua Tennis game on the Playstation, Playstation 3 and PSP since then. 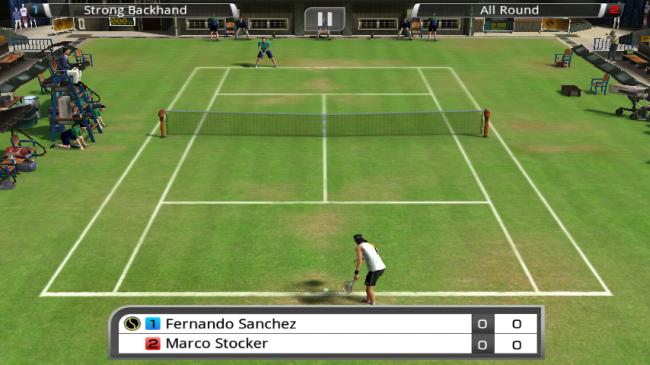 When I heard that Sega was releasing a Virtua Tennis game for android, I really couldnâ€™t contain my excitement. The thought of being able to play the game wherever I am on my phone filled me with a huge amount of joy! Sega finally released the game last Monday, the 19th March to Xperia handsets only. Hopefully they will open this up to other types of phones soon, but until then those with a Sony/Sony Ericsson handset are able to find the game in the Android Market Google Play Store. It's a hefty 369mb in size, but makes use of the new feature of the Play store to install game data via the download directly to your sd card (so you donâ€™t need 369mb of free app space!). I grabbed the game on my Xperia Play, and you can see if the game managed to meet my extremely high expectations below! Of the above, play style is the only one that will affect your actual playing of the game. If youâ€™ve played the most recent Virtua Tennis games on a console, youâ€™ll know that you are given a power gauge that you can fill up by doing more of the things that define your play style. The android version of the game also includes this. For example if you pick a play style of â€œStrong Forehandâ€, then your power gauge will increase a small bit every time you do a strong forehand shot. When your power gauge hits max, you can steady yourself for a supershot! Which pretty much guarantees a winner. I was a little disappointed with the limited character customisation options, you canâ€™t change the look of your player at all, nor the stroke or serve action that you can with the console versions. Once youâ€™ve created your character, you can enter the World Tour. The World Tour actually follows real world days. For each day there are three available tournaments to play, and you may only play those on the current day. Once you play a specific tournament, another one appears in its place, so you will always have something available to play. You have a pot of money which you can use to pay for entry into tournaments. If you win the tournament, you get prize money to fund your entry into further tournaments, if you lose? Well, just try not to lose! Every time you win a tournament your World Ranking increases. Iâ€™m not really sure what the point of the ranking is, as tournament entry is just based on how much money you have to spend. The World Tour mode has been keeping me interested so far, but I do worry slightly about the longevity of this game mode. There doesnâ€™t seem to be any clear way of improving your character, other than through the ranking system. Some sort of character stats feature would have been a nice inclusion. 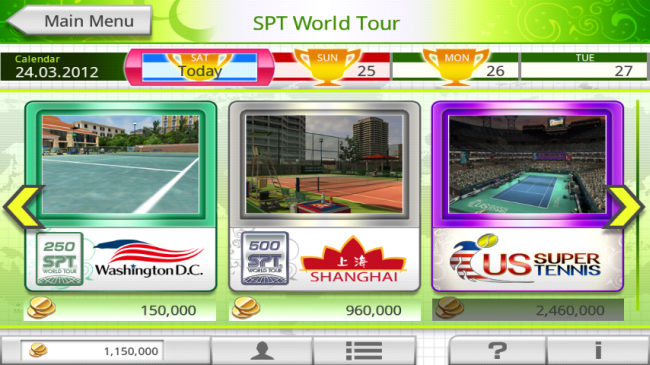 Exhibition mode is your standard fare, choose from any unlocked court and any player for an ad hoc match. Personally I donâ€™t really make use of this mode much, I prefer to play a match in the World Tour mode instead. However, exhibition is good for those moments when you only have 5 minutes or so spare. The game offers a bluetooth multiplayer feature. I havenâ€™t been able to try this out myself yet as I only have one Xperia Play, but once the game is released for other phones Iâ€™ll definitely be looking forward to trying it out. The graphics are quite good for an android game. Itâ€™s not PS3 quality for sure, but it definitely does the job. Animations are smooth and the game slides along without any lag whatsoever. It reminds me of the quality of graphics found on the PSP version of the game actually, and that's a good thing by the way! There are some nice touches added too, such as the serve speedometer updating when you take your serve and your player throwing their racket up in the air after a bad shot! The game also displays the crowd, umpire and line judges, all making for a more realistic game. These are all static however, it would have been nice to see some movement, especially when a ball is pummeling towards them! Sound effects are quite good when hitting the ball, everything sounds realistic. The crowd is silent during gameplay, which does make everything a bit more quiet, but I guess that's sort of realistic, as they generally are during gameplay in real life. The crowd do make a noise when a point is won however. 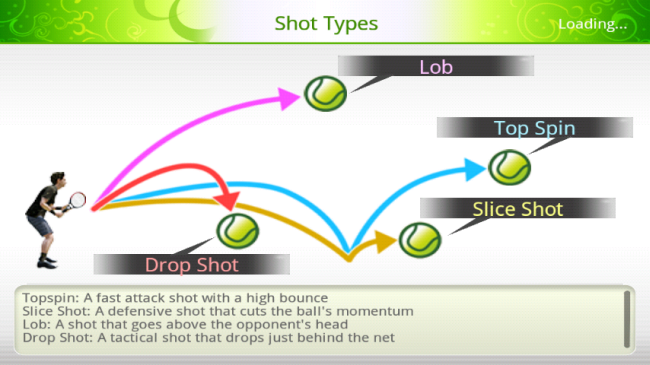 In typical Virtua Tennis fashion, you have 5 different shots, each mapped to one of the four control pad buttons on the Xperia Play (the 5th being dropshot, which occurs when you press back and the lob button), including lob, top spin, slice, dropshot and super shot. The controls work well and are very responsive. The only issue I have with the Xperia Play is that the touchpads are not utilised at all, these would offer a lot more freedom and control when moving around the court than the dpad offers. Generally, I think Sega have done a really good job with this game. There are a few niggles, or lack of features that I think could have pushed the game further though. Such as player stats and a way to improve upon them, or use of the touchpads on the Xperia Play. But overall I havenâ€™t been disappointed, the game stays true to the Virtua Tennis franchise and if you liked any of the previous iterations, youâ€™ll love this too. The game costs Â£3.82/$4.99, and is well worth the money in my humble opinion!